This weekend I discovered Pocket, a new app that will let you save articles/urls to read later from Twitter, or anywhere else on the interwebs. I check my Twitter feed multiple times a day for about 5 minutes at a time. If I saw a compelling headline, I used to email it to myself to read later…not anymore! The app I discovered is called Pocket (formally Read it Later). It is simple to setup and it essentially bookmarks any url from the internet for later reading. Create an account with GetPocket.com or via the iPhone or Android App and then associate it with your Twitter mobile application. Go to Twitter>Settings>Read Later (under services)>Pocket and enter your Pocket Credentials. Once you setup Pocket with Twitter, you’ll see a new setting when you long press the URL of the article you’d like to save (or put in your Pocket). 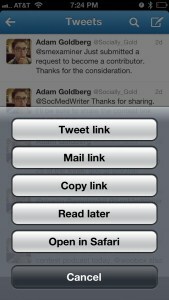 Pocket isn’t exclusive to Twitter as there are other ways to save URLs. Visit the Pocket website to see all that they offer. I installed the Pocket Bookmarklet, which allows me to save articles from anywhere on the web with my browser. 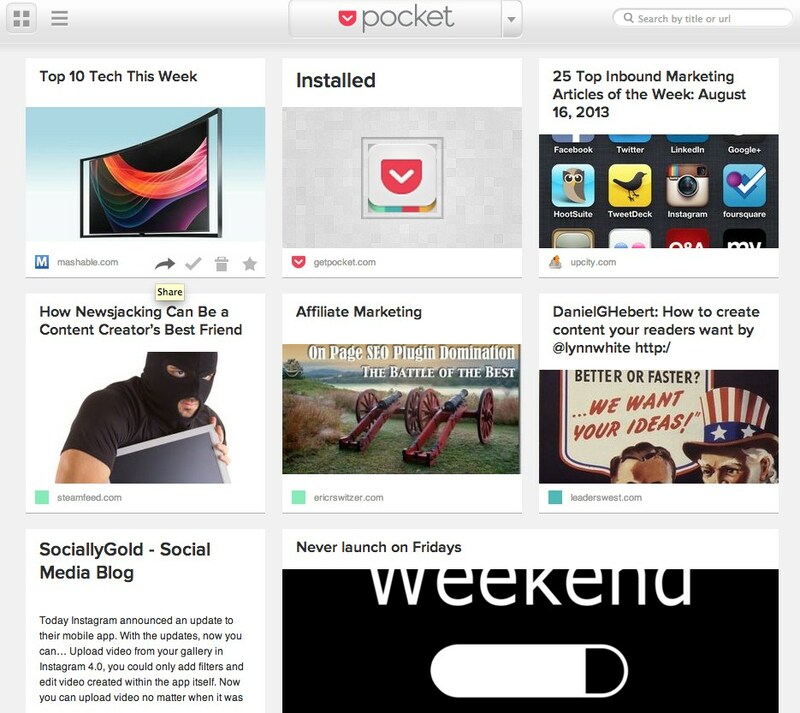 Pocket makes articles available you’d like to read later on any of your devices, anywhere, anytime. No more emailing articles to myself for me. What else can Pocket do?
. Favorite the URL, which will be helpful for sorting it later. This is what my Pocket currently looks like from my web browser. My favorite aspect of Pocket is that clicking the link to read defaults to a Pocket version, which gives you a cleaner, much easier to read iteration of the article. You also have the option of viewing the original, so not to worry if you are a realist. There are also integrations with IFTTT and Buffer if you already are subscribed to those services, which I highly recommend doing. Look out for future posts covering both of these services. Well…have I convinced you to become a Pocket user? Let me know in the comments what my persuasion skills are if I did. As always, thank you for reading. if you enjoyed this article, please share it with your social networks. It would really help me grow my blog. 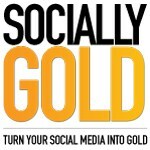 If you are looking for updates from SociallyGold as they happen, I invite you to join an elite group of folks turning their Social Media Into Gold on a weekly basis, you’ll even get my Social Media Strategy Planning Guide.